Close Listening: How Sound Reveals The Invisible : Shots - Health News The stethoscope seems so simple — a 19th century tool for listening more closely to the human heart or lungs. It also sparked a culture of listening that is transforming the way scientists learn. Microscopes illuminate the invisibly tiny; telescopes reveal the heavens. But sound? Scientists didn't really see it as all that important, until an amazing invention came along that opened new worlds: the stethoscope. "I think the first time one can see this kind of 'listening culture' is with the development of the stethoscope at the beginning of the 19th century in Paris," says Trevor Pinch, a Cornell University sociologist. "You couldn't see inside a body back then," Pinch says, "unless of course it was dead, which was a bit late for anyone except a pathologist." But a stethoscope told a living story — of circulating blood, or the seesawing of lungs. Early stethoscopes from the 1874 book Clinical Lectures on the Principles and Practices of Medicine. Later, binaural stethoscopes were developed that allowed the listener to hear the sound with both ears. "It was one of the first ways of getting a diagnosis on a patient independent of their own version of what was happening," says Pinch. "In fact, it's become so important that the emblem of the physician is often the stethoscope around the neck — that's how you tell who the doc is." 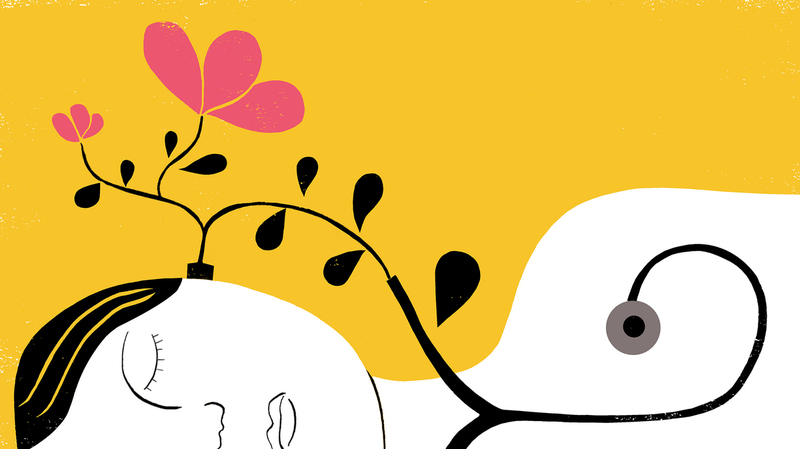 We asked one of those doctors to help us hear the way he hears. Dr. Adam Law, an endocrinologist and primary care physician in Ithaca, N.Y., was teaching a medical student how to use a stethoscope to diagnose a heart problem in one of his patients, and we brought along recording equipment so we could listen in. Law's student is Nick Maston, in his third year at Weill Cornell Medical College. Law ushered the patient into the examining room, and turned to his student. "Nick, why don't you examine this patient's cardiovascular system?" We'd already plugged our recorder into the electronic stethoscope, but Law and Maston both warned us — interpreting sounds from inside a body is not for amateurs. "As a student," said Maston, "it's hard to learn ... you have to listen to thousands of hearts to find that out." Law turned to his student: "Hear the difference in quality?" Maston didn't hesitate: "Yeah; very loud second heart sound." Law's patient has a heart murmur — a malfunction of the heart valves that control blood flow. Textbooks say you can hear a murmur's "swishing" sound. But if you didn't hear it, don't feel bad — we journalists couldn't make out any swishing sound, either. Maston apparently could. "So, do you want me to talk about what I heard?" he asked us. "It sounded like a mitral murmur; but I heard it best where I expect to hear an aortic murmur. So ... this is a situation where Dr. Law is going to have to jump in and rescue me." Law confirmed that Nick had it right. The patient's heart has a little bit of both types of murmur, he said, from the mitral and aortic valves. We amateurs didn't hear it because we simply didn't know what to listen for. Think of the sound as if it were the audio version of a fossil bone or relic lying in the dirt; a seasoned archaeologist can pick those out more readily than other people because the pros have a sort of "search image" in their brain. "The musical note of the heart is actually complicated," Law said. "It has harmonics; it has overtones. And that gives the sound — and the murmurs — in the heart a certain quality," he explained. "One has to tune one's ears." So how do you tune your ears? "Pattern recognition is the key," Pinch told us later. Pinch has made a career of studying how scientists listen. He notes that listening has certain advantages over vision. "The visual field is kind of in front of us — like a kind of screen," he says, while sound is "all around." If seeing is like being in an art gallery, hearing is more like being in a swimming pool — where we're swimming all the time. At night, we'll wake up to a baby's cry, or to the sound of danger — a predator, perhaps. Such sounds trigger an ancient alarm system buried deep within our species' brains. Listening, says Pinch, especially at night, "has probably been evolutionarily very, very important." The problem of using sound to understand physical phenomena — from the weather to animal behavior, to the fact that an engine needs oil — is that sound is ephemeral. It's in one ear and out the other. 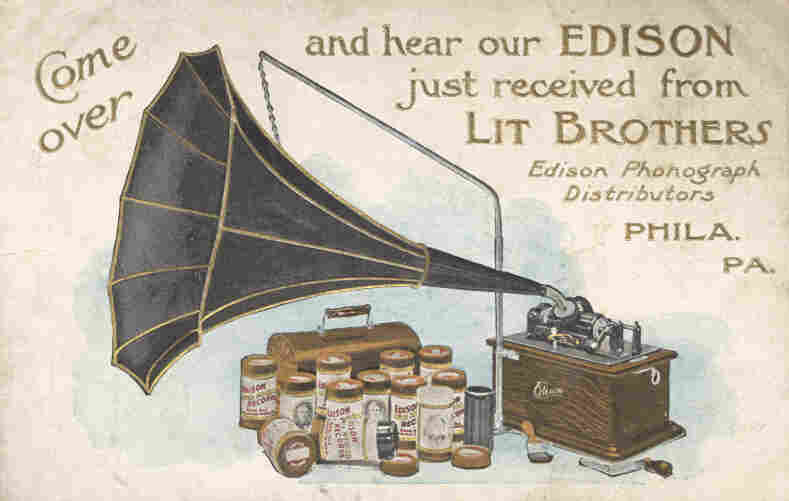 An advertisement for Edison's phonograph circa 1900. That is, until, as Pinch points out, people invented a way to nail down sound. "I think the development of the phonograph, in particular, around 1880 ... really does change how we think about sound," Pinch says. "Because, for the first time ever, sound is really transportable. ... You can store it in a medium." Once people could capture sound, and really listen, Pinch says, that opened up a universe of new possibilities. Editor's note: An alert reader reminds us that heart murmurs can arise from other sources, too, and that many such sounds are harmless.